The last one I ever saw was similar to that one. My sister Anita—she was born in 1926—she was wearing these during WWII. A traditional woman’s parka made of caribou fawn skin, miniature in size but accurate in all of its details. Women’s parkas reach below the knees, with U-shaped front and back flaps and high cut sides. Anna Etageak: Yes. Up north people mostly have this kind of parky [parka], the women. Anna Etageak: Yes, long ago. When old ladies were younger, they used to make fancy parky or fancy boots. Oscar Koutchak: The last one I ever saw was similar to that one. My sister Anita—she was born in 1926—she was wearing these during WWII. We fled from Unalakleet thinking about the Japanese. And she used to use this kind of parka to go to the Traeger store uniagaqłuni Aŋuagaq [by dog team with Aŋuagaq]. 1. This was discussed with a man’s style parka E007589. The atigi or parka (a word of western Siberian-Russian origin) is a hooded, loose-fitting garment worn by both men and women. New and traditional designs are still made in Northwest Alaska today. 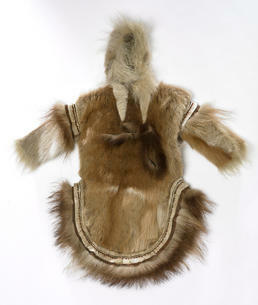 This mid-19th century miniature version of a woman’s parka is made of caribou fawn skin, with wolverine trim and decorative bands of white caribou or reindeer fur. At the neck, both men’s and women’s parkas usually had narrow, triangular inserts, or gores, that extended part way down the front, as on this example.